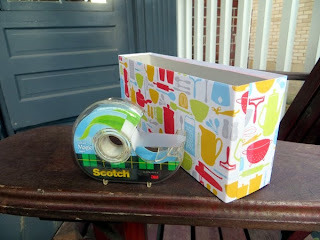 Yay for scrapbook paper: is there anything it can't do? It can even give a girl a break from clearing out kitchen cupboards to do some totally legitimate crafting (not that there is any other kind, of course) and resolve some space issues at the same time. Want some cute storage boxes for your cupboards too? First, decide which side of your box you want for the opening, and cut it away. If necessary, tape the remaining walls of the box for stability. Then measure and cut strips of scrapbook paper to cover the sides. Don't worry about the bottom: it won't show! Next, tape the paper neatly to the box, ensuring that each paper strip is centered over the side that will be on display for a neater look. 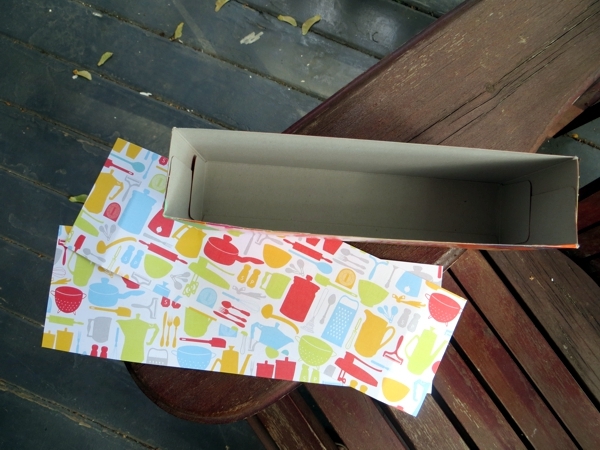 Fill the box with the contents of your choice and tuck it into your cupboard. I gotta say, I love the boxes on the outside of cookies and crackers. 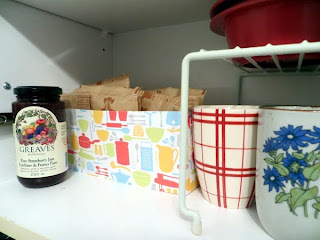 You may have read how I put them to use as shallow drawer organizers last fall, and now I am using more to separate hair accessories from bug cream along the front end of my deep dresser drawer at the cottage - same kinds of boxes, just cut for depth rather than length. This particular box frees up extra space in my cupboard, because it's a bit smaller than the one the oatmeal comes in. You know that whole "sold by volume, contents may settle" thing on the side of food boxes? Well, once that food has settled, I'm very happy to tuck it into a box that matches its new size. And the idea is great for more than food. 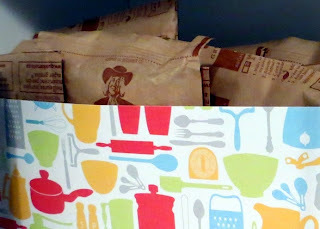 After I did this box, I covered an empty bulk-sized box of Rice Krispie Squares (yum) for stashing my microfiber cleaning cloths. The paper I had couldn't cover all the way around that big box, but it doesn't show where it counts and it is so much more cheerful to start cleaning now. So: twenty minutes well spent. I bet a box like this would look fantastic in a yarn cupboard too, don't you?